V-Moda Remix is the first portable speaker with a built-in headphone amp | What Hi-Fi? V-Moda's headphones have received mixed reviews here. They look stylish, but most models seem to lack where it counts. 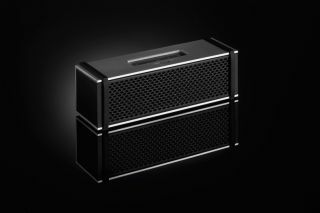 However, the company's first wireless speaker, the Remix, looks more interesting. It's the first to come with a built-in headphone amp, which should improve private listening no end. It has also been 3D printed, and there are a range of add-ons which you can use to customise your speaker. The Remix also features a glass fibre dual driver and a passive bass reflector, which promise a clearly defined midrange and impossibly low distortion. V-Moda also claims it will deliver a fully immersive 3D soundstage. The built-in headphone amp delivers 83mW across two channels, which should please owners of high-end headphones. A range of 3D-printed add-ons are available, though some of them are pretty gaudy (see video above). They range in price from a reasonable $40 (£33) to the ridiculous $370,000 (£302,000). Judging by the 'lifestyle' emphasis of the video, the speakers aren't really aimed at audiophiles either. It charges via USB-C, has a built-in microphone for voice calls and summoning your phone's virtual assistant, and can pair with two devices at once. It also works with Amazon's Alexa personal assistant, so you can pair it with an Echo or Echo Dot. The Remix is on sale now in the US, priced $300 (£245). We're waiting to hear about UK availability and pricing.